Ali Ghassemi teaches Sec. 1-5 Math at Nova Career Education Centre, which is part of the New Frontiers School Board in Châteauguay, Quebec. This school year, Ali’s centre acquired a set iPads. As soon as Ali got his hands on an iPad, he began to pour over hundreds of different math apps in an attempt to find new approaches to help his students succeed in greater numbers. – Educreation: Record math lessons on screen. View hundreds of various lessons from other teachers. – Converter: Easily convert units from one to another. – Algebra Touch: Rearrange, slide, and tap variables to solve equations. – Tritutor: Shows how to solve quadratic equations, step-by-step. 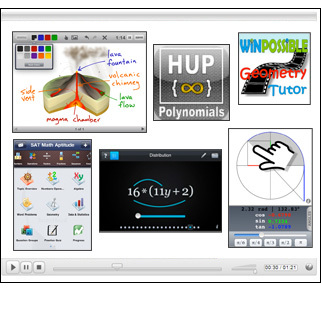 – Polynomials by HUP: Helps students work with polynomials through video. – Math Quadsolve: Solves quadratic equations. – Mathgraph: A graphing application for the iPad. – Winipossible Geometry Tutor: Videos to help students with geometry. – Unit Circle: Helps students understand triangles and how they relate to trigonometry. – Math Aptitude: 1500 Math questions with step-by-step solutions. This entry was posted in Teacher Feature and tagged ali ghassemi, Math, qpat, teacher feature, tracy rosen. Bookmark the permalink.